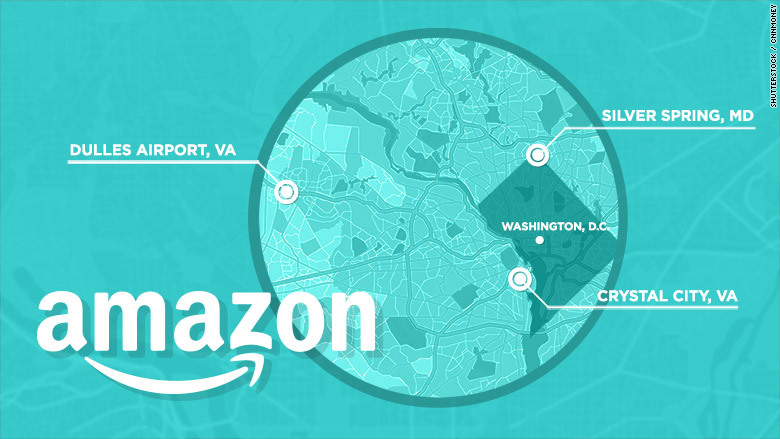 Three Amazon headquarter finalists are inside the Beltway. What gives? On Thursday morning, the Northern Virginia Chamber of Commerce held a regional conference with a panel full of local economic development officials. Ten minutes before the event started, they were given some welcome news: Each of their communities had made the final cut for Amazon's new headquarters. "It was a pretty wild moment, because we realized that all of us who'd be going on stage would be shortlisted," said David Petr, president of the Montgomery County Economic Development Corporation, which borders Washington, D.C., in Maryland. The panel discussion focused on issues of shared regional concern, like transportation and workforce development. But the Amazon news sets up a competition that only one of their jurisdictions can win — and that may have been part of the point. Amazon's highly publicized process for picking the place it plans to invest $5 billion and hire 50,000 people has touched off a nationwide contest to win the Seattle-based internet giant's heart. Nowhere is that rivalry more intense than inside the Beltway, where Washington, D.C.; Montgomery County, Maryland; and Northern Virginia are among Amazon's 20 finalists. When selecting new sites, companies try to pit neighboring jurisdictions against one another in a bidding war for valuable tax incentives, and the closely packed local governments in the D.C. region are particularly susceptible to such attempts. David Zipper, whose job it was to attract and retain businesses in D.C. between 2009 and 2013, saw companies do it again and again. "They looked at all three jurisdictions, D.C., Maryland and Virginia, precisely because they wanted to get as many incentive dollars as possible out of the jurisdiction they ultimately were going to choose," Zipper said, remembering Northrop Grumman's site selection process in 2010. Of course, the D.C. region has plenty going for it: An educated population, robust transit system and access to one of the Amazon's largest customers, the federal government. Amazon's CEO, Jeff Bezos, already owns a house in D.C. and The Washington Post. The area has also had a long history of technology development, having incubated companies like AOL and Nextel, as well as providing IT contractors for government agencies. "Real software and tech innovation isn't just product innovation, it's services solutions, and just being skilled at managing technology, and we're really the leaders in that in the world," said Jonathan Aberman, a D.C.-area tech investor. "So I think Amazon's interest in this region shows how informed they are about the nature of technology talent." Accordingly, the Washington region's local governments and some private developers put forth detailed proposals for places that could accommodate the new complex, including four rapidly developing D.C. neighborhoods, a complex near Dulles airport, an office space in Virginia's Crystal City and Montgomery County's diverse, metro-accessible suburbs. But they also put cash on the table. Although most jurisdictions have not disclosed the precise incentives they're offering — and heavily redacted their responses to public records requests from local reporters — the details will have to surface eventually, since legislative bodies will have to sign off. Maryland Governor Larry Hogan put out a hefty opening bid on Thursday, promising to submit a proposal of tax breaks and infrastructure improvements worth $5 billion. Jim Corcoran, president of the Northern Virginia Chamber of Commerce, shrugged his shoulders at the tax breaks arms race. "In this environment, tax incentives are a reality," Corcoran said. "If that's what it's going to take to get such a game changing organization, then that's what some will do." But those rich incentive packages fly in the face of what research says about how companies actually make their location decisions and what leads to economic growth. 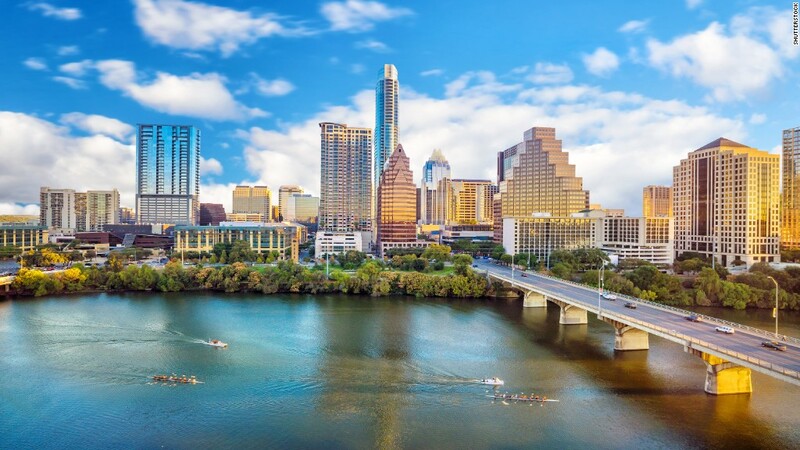 For example, University of Texas economist Nathan Jensen has found that Maryland and Virginia's flagship incentive programs, pots of money available attract or keep businesses in the states, led to no more job creation between 2006 and 2012 than would have occurred without them. What incentive programs actually accomplish, Jensen said, is enabling politicians to claim credit for attracting new headquarters. For those reasons, urban studies theorist Richard Florida took to Twitter on Thursday to encourage the 20 finalist cities for Amazon's second headquarters to make a pact to offer no incentives, so that at least whichever city that did win wouldn't have to give away so much of the monetary benefits. There doesn't seem to be much chance of that happening in the D.C. region. But Petr, of Montgomery County, said that the three local contenders might at least cooperate with one another to help one of them win the bid over a contender in another part of the country. "If it goes to one of the three, what do the other two do to financially incentivize it or provide some other support?" Petr said, describing his initial thinking. "Or do we even go back to Amazon and say maybe this campus could be spread across a few jurisdictions?" And that, of course, could be part of Amazon's plan as well.